About 5 years ago, the Toronto Star published a photograph of an old RAF Vulcan, now a monument at CFB Goose Bay in Labrador. So you'll have to imagine looking head on at a at the nose of the massive bomber, it's 2 huge intake manifolds and delta wings stretching almost 100 feet from tip to tip, peering over a rise in the road as you approach the base. Mythological in name (i.e. pre-Spock) and mythological to a generation of Dinky Toy collectors as well. I had one as a child although my brother disputes this to this day. I can remember a metallic silver triangle bigger than my hand. It didn't fly (not even the pre-war Dinky gliding hole in it), and it stood on an undercarriage of tiny wheels. The landing gear is often broken off through misuse or modification to make it look like a flying model. The Dinky Vulcan was quite heavy and tricky to suspend from the ceiling without a spider's web of fishing line to support it. The real Vulcan was a delta wing bomber as wide as it was long. Standing 261/2 feet high, it weighed 170,000 lbs. and generated a maximum speed of 625 mph from its 4 Olympus jet engines. A later version of the same engine powers the supersonic Concorde. Development of the aircraft began in 1944 as the RAF looked towards post war air power requirements and the dawn of the nuclear age. The first Vulcan flew in August of 1952 from the Avro factory in Cheshire, England. 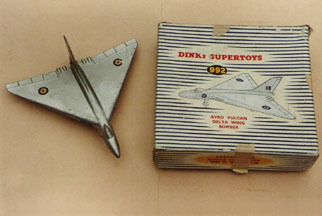 The jet bomber became operational by 1956, about the same time as the Dinky Toy was released. Only 136 real Vulcans were built, and they remained in service through the Falklands War. The last flight of any Vulcan was September, 1992, at a UK airshow . There are a number of survivors including 16 at various English museums, one on loan to a California museum, the one in Goose Bay. When I searched for Vulcan on the net, I discovered quite an interest in restoring them. Visit the Vulcan Restoration Trust for the Southend Vulcan and from there follow all sorts of links to Vulcans around the world. But I have to provide the link to the Dinky Toy in this article. For it too attracts a great deal of interest as probably the lowest production run Dinky Toy. 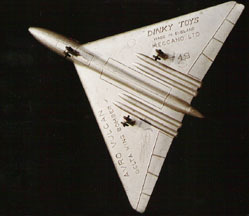 There are rarer Dinkys (pre-war casualties of fatigue or rare commercial paint variations, prototypes that may or may not have been produced) but the Vulcan is unique. Mike and Sue Richardson give a pretty complete account of the production difficulties Dinky encountered in their book "Dinky Toys & Modelled Miniatures", first published by New Cavendish, 1981 (and just recently released in an updated, expanded version). At the time Dinky was experimenting with aluminium (English spelling I have never understood since the Latin root would appear to be lumina) as a replacement for Mazak. This may have been due to shortages engendered by the Korean War, a desire to save weight, to reduce cost, or to simply try out the newest wonder material (remember Kitimat and the wonders of aluminum from your Grade 6 geography?). Dinky produced some of the Studebaker petrol tankers--they're noticeably lighter than the common mazak versions, the Maundsley Horsebox, parts of the 982 Car Carriers, and the Vulcan in aluminum. There were problems getting the aluminum to flow evenly to the wing tips such that the design was modified and the wing tips rounded off after a very few models. Then the molds cracked under the very high temperatures required to get aluminum to melt--as you would know if you have ever been to the pot lines at the Alcan Kitimat plant. You can see the resultant crazing on the underside of the Vulcan wings. The net result was that only about 500 of these were ever made before Dinky gave up. Incidentally, I have never seen a good reproduction of a Vulcan despite all the rumours. It only makes sense--if Dinky couldn't make them, why would anyone be able to fake them? So I lost track of the one I had as a kid--it was given away to the neighbour's kids along with the other Dinky toys, a box my Dad had made that was full of Meccano sets, and the Britains soldiers. When I first started collecting Dinky Toys again in the 70s, I wasn't as interested in the airplanes and sold the first Vulcan I found for the grand sum of $25.00. All I knew was that it was another large Dinky airplane and that's what they sold for and I wasn't really collecting the airplanes. I still know where that one is and have many times since offered to more than double the buyer's investment! And then I started to see the ads--usually from UK collectors offering to pay stupendous sums for a Vulcan--I still have a copy of one offering $550. In the mid 70s! A Dinky Vulcan is always silver and carries the number 749 cast into the underside of the wing (although the model and box were re-numbered 992, I don't believe there was a second number cast.) The first real Vulcans the RAF received were in fact painted silver. This was shortly changed to white (to protect the airplane and its crew from the flash of a nuclear explosion!) 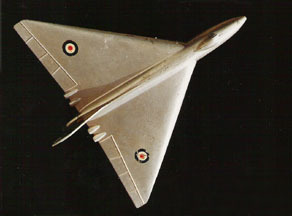 When the role of the Vulcan was switched to low level flying, the paint scheme became the grey and green camouflage familiar to Dinky owners of the Hawker Hurricane, the Supermarine Swift and the Gloster Javelin. I have seen restorations of the Dinky Vulcan, including one pictured here owned by Dave Shelton, Victoria, BC in this paint scheme that are very good but NOT original. Over the years, I have probably seen, or heard about nearly 100 survivors of the Dinky Vulcans. Not all of them were in good condition. As I mentioned earlier, the landing gear is fragile, the wing tips break easily, the identification roundels wear off (no reproduction that I know of yet) and the paint itself wears. It is very difficult to reproduce the colour and sheen of an original. I imagine that most owners or their parents hesitated when it came to disposing of this fairly sizeable toy. A few have been discovered in the unlikeliest of places. One turned up in a junk bin at a toy show in Vancouver and changed hands for $3.00. Another turned up, a nugget of gold buried in a box of toys, in a chest of drawers, in a basement of furniture given to a house clearer by the owners anxious to just sell the house. I made the house clearer's day with that deal. I've missed a few--the missing toy in a box that was supposed to be sent to me from Winnipeg, a couple or 3 that were just out of reach price-wise, a few tantalizingly close in shoulder bags being offered around toy shows. And then one day, my own Vulcan came out of the woodwork. A vaguely familiar face inquiring about the price of a Dinky Vulcan brother Michael had for sale. Turns out the inquirer actually has a Vulcan he wishes to sell. The pieces fall into place. It's the Vulcan that had been given away to the neighbour so long ago now available again but at a price. Of course we paid it. It's not often that you actually get to re-acquire the very toys you had as a child. Every collector tells you it's part of the lure and everyone chases the dream but this was the real thing. Another good part--along with a few of the old Dinky toys, I reacquired some of my original Britains lead soldiers ( I knew which sets were in the box before it was opened ) and the plywood box full of Meccano. My Dad, like many 1950s Dads made everything out of plywood--it was the miracle do-it-yourself material of the 1950s. Just look at any pile of Mechanics Illustrated magazines from the era to find plans for everything from sailboats to wristwatches all made out of plywood--the all-Canadian material before duct tape. Unfortunately, in this case, that meant that the original Meccano boxes were discarded but the unpainted plywood box was exactly as I remembered it. The bad part, my brother ended up with the Vulcan.